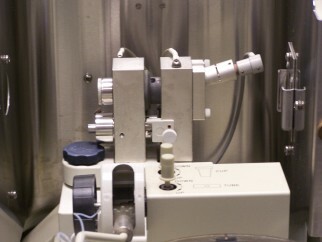 Graphite furnace atomization (also known as electrothermal atomization (ETA)) is a technique for improving the sensitivity and limit-of-detection for atomic absorption measurements. A small amount of sample or standard solution is placed inside a hollow graphite tube. This is resistively-heated in a temperature program to remove sample, burn off impurities, atomize the analyte to form a plume of free metal vapour, and finally clean the tube. 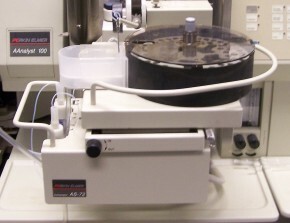 The image below shows a typical bench-top flame atomic spectrophotometer that has been configured for graphite furnace operation. Click on the different parts of the image, or use the links below, for more details. The main image (below left) shows the main furnace assembly positioned in the light path through the sample compartment of the AA spectrophotometer. The graphite tube is just visible between the two electrodes in the centre of the image. 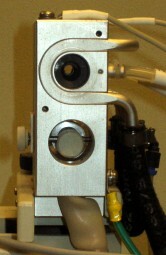 (Compare this with the close-up of the burner assembly for flame operation.) The electrodes are usually water-cooled, while an inert gas is used to exclude air from the furnace tube in order to prevent sample oxidation. The close-up shows the view through one end of the electrode/furnace assembly. Note the power lines and cooling water connections on the back (right-side of image). This image shows the graphite furnace assembly at the point of atomization, during which the absorbance of the sample vapour is measured at the appropriate wavelength for the element of interest. 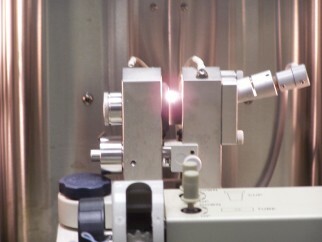 The light source is the same as for flame atomic absorption measurements, i.e. either a hollow-cathode or electrodeless discharge lamp (HCL or EDL.) Because the atom vapour is confined within the furnace tube, a much greater population of atoms is present than would be found in the case of flame operation. This results in significantly lower limits of detection for GFAAS compared to Flame AAS. 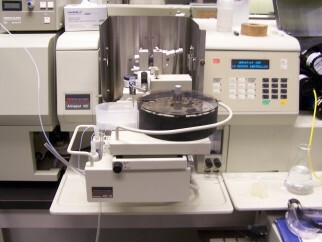 This shows a close-up of the auto-sampler used in conjunction with the GFAAS. Samples, standards, and a blank are loaded up into the carousel, and a wash solution is pumped through the white plastic tray just beside the carousel. This allows the sample probe to be rinsed between measurements to avoid sample carryover and cross-contamination. A mechanical pipette with a small tip could be used to introduce the samples manually, but requires some practice to acheive consistent placement of the tip into the graphite tube.